Here you will find a wealth of data I have collected over the years on general calculators, HPs calculators, TIs calculators, and on my all time favorite mechanical calculator, the CURTA. I recent years I have become an expert with the amazing Curta calculator. And it's mechanical not electronic! But it represents a final ultimate, state-of-the-art achievement in the mechanical world before the electronic calculator revolution took over and over night obsoleted all mechanical machines. Interestingly the Curta held on for many years because it was so popular among road rallyest and surveyors. I do collect and study the manufacturing variations of the two models of the Curta calculator. My two exploded view Curta posters are wildly popular around the world and have been featured in museum displays and displayed in the halls and offices of NASA. My favorite electronic calculators are HPs but I don't plan on this page even starting to compete with "The Museum"! HP introduced the 1st scientific calculator (HP-35) then introduced the first business calculator (HP-80). To this day the all time most popular calculator is the HP-12 Business calculator. I still like to gripe about why HP abandoned the scientific calculator (HP-11, HP-15) in this wonderfully convenient format. My Calculators of HP poster is another popular poster I created. It even serves as a reference in the support offices of HP. Finally my newest posters of the History of the Telephone and Modern US Currency are the latest additions to my poster line up. Yes, a slight deviation from calculators but I always remembered touring the phone company as a child and receiving a poster that showed the history of the telephone. My Telephone poster is an updated tribute to this now 45 year old poster. I also find the art and design that is in the US currency amazing. My Modern US Currency poster arranges all the major version of all the denominations. Showing both the front and back side of each bill so you can study and appreciate the art and changes that have happened to the US currency over the past 100 years or so. I also hope this poster can serve as a teaching aid for school teachers. Look around, enjoy yourself, and marvel over how calculators (both steel and silicon) have changed our world. NOW SIX POSTERS ARE FOR SALE!!! Here are links to some of my favorite posters that other people have created. Click on a poster to learn more. 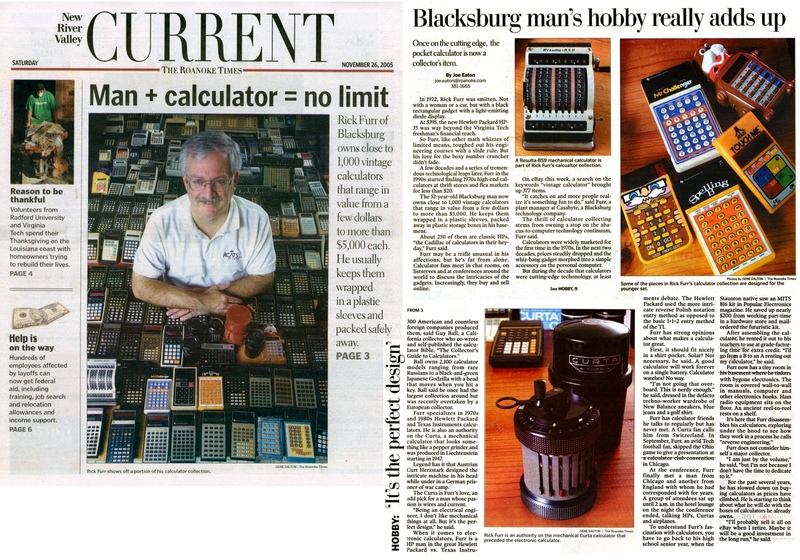 Click Here Here's an article that was in the newspaper about my calculator collection. 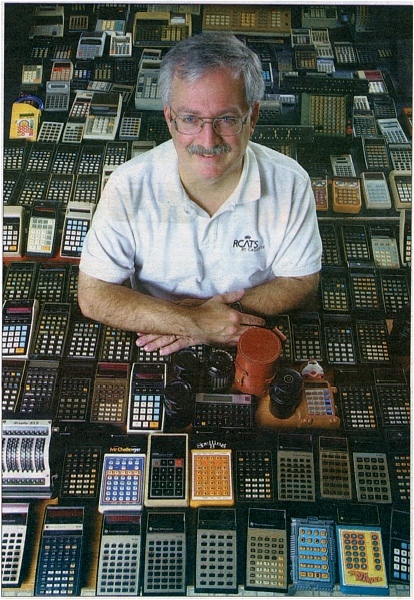 In the photo the newspaper photographer wanted me to be surrounded by some of my calculators. So we arranged a ping-pong table in the background and a card table in the foreground. Then we placed two wide boards on either side so there was a small hole in the center. Next we placed all the calculators we could fit on the tables and then I squoze into the center for the photo shoot. It made for a cool shot but sadly the photographer would not give me the original. Learn more about the HP-12C Platinum, HP-32C, and the HP-33CS on the HP Reference page. Here are places that will help you with your most frequently asked questions concerning repairs, spare parts, and manuals. The title says it all, this is a collection of Collector Lists, Data Lists, Classified Lists, Mail Distribution Lists, and Forums. If you are wanting to buy or sell a calculator then reference the Classified Lists, Mail Distribution Lists, and Forums section. Over a million PC users have already downloaded Calc98, our popular free engineering, scientific and financial calculator for Windows. The calculator includes functions for statistics, use of different number bases (binary, octal, hexadecimal and base-n), metric units conversions and physical properties and constants. It has financial functions including investment, loan and mortgage calculations. It also calculates time functions and has a stopwatch feature and RPN (Reverse Polish Notation). It runs on Microsoft Windows (WindowsNT, Windows95/98/ME, Windows2000/XP) and WindowsCE (Pocket PC). Here is some information on some very interesting and some very common desktops that I own. Why is the telephone touch-tone key pad arranged differently from the calculator key pad? Why is the keypad arrangement different for a telephone and a calculator? This is my article on Electronic Displays that appeared in the Winter-Spring 1997 International Calculator Collector. If you've ever been to Erez Kaplan's -- Calculating Machines page then you will have noticed his cool rolling numbers image. Click this title if you would like to see all of the different numbers used in this cool image. Go to his page if you want to see the real thing. "This is another must have for ANY calculator collector." - Rick Furr. "The Collector's Guide to Pocket Calculators" by Guy Ball and Bruce Flamm is back from the printer and now being shipped. This 200+ page, softcover book contains a detailed listing of over 1500 known portable/pocket calculators from the early 1970's (the "Golden Age of Pocket Calculators"), as well as historical information from the 1960's and 1970's. The book features over 470 photographs of various models from over 220 manufacturers around the world (including calculators from lesser-known companies in England, Switzerland, Netherlands, Spain, Germany, Bulgaria, and Russia). 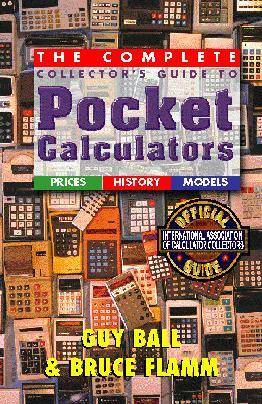 "The Collector's Guide to Pocket Calculators" also includes a comprehensive value guide to help you gauge rarity and desirability of the various models -- especially as they relate to each other. The book can be purchased for $23.95 plus $4 for USA first class mailing ($6 to Canada and Mexico, $8 for airmail to other countries). California residents please add $1.86 state sales tax. RISK is the most classic strategy board game of all time. If you are looking to play Risk online, you are in the right place. I have joined every variant of Risk clone out there, looking for the best experience, the best community and the most fun. The quality of the Risk clones out there ranges from good to terrible, so I have rated 5 important aspects of all these sites and compiled them into one meta score. Take a look and see which Risk site would be best for you.